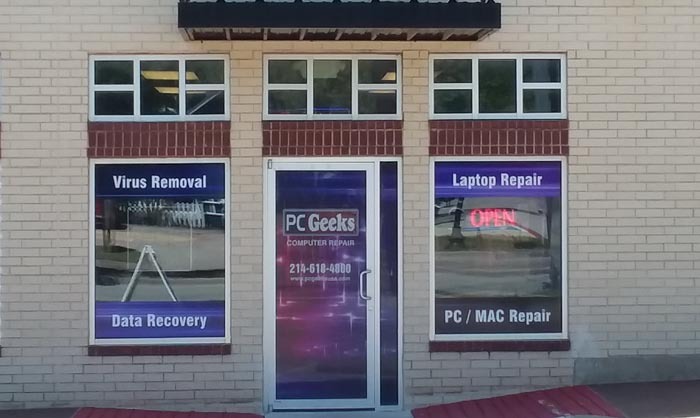 Conveniently located just five minutes off the Dallas North Tollway on Main Street, Frisco PC Geeks is your alternative to big box retailers pushing costly replacement over computer repair. Using comprehensive diagnostics, we service both Mac and PCs, providing onsite, trusted service with results we guarantee. We understand the stress computer issues can bring; we are here to get your problem or need resolved quickly. Serving Frisco, McKinney, Little Elm, Prosper and beyond, Frisco PC Geeks can address a myriad of computer issues. We repair broken screens, fix DC jacks, install software, upgrade hardware, and more. We remove viruses and other malware and, importantly, we assess any security issues you may face as a result of the malicious software. We pride ourselves in recovering files deemed unrecoverable. Contact us today to discuss your needs. Let’s get you back to work – or play – today. Verified Customer Reviews from Review Fire. Featured Reviews Shown First. Overall rating: 4.8 out of 5 based on 291 reviews. My computer was fixed fast and for a reasonable price....cheaper than the "Best Guys"! The whole experience was great. My son was so excited how quickly his computer got fixed. Great customer service, professional, communicated and answered all of my questions, and a very quick turn around to get the computer back to us. Friendly, professional, informative on what exactly will be done to your computer, given a feeling of computer is in safe hands, minimal personnel come in contact with the computer. Great experience. Provided useful Information via first contact by phone and at store. Completed service within the time indicated and at price quoted. Communicated in a very clear and understandable style. Honest about what was happening to my computer and not trying to push/sell any unnecessary work or products to me. They did a great job fixing my daughter's Dell 2 in 1 touch screen. The diagnosis, communication and repair were through, correct and complete. Pricing was fair compared to doing-it-yourself. All the service people were very friendly and answered all of my questions. They also followed my request and returned my computer to my expectations. Great advice on repair of all-in-one desktop computer. Fair prices. Prompt service. Great personal service. Nice to be able to talk directly to the person who will be working on your machine. Very fair and honest assessment of work to be done. Don was very professional and helpful in advising me what to do with my laptop. Matt was very congenial when I picked it up. Everything! You guys are great! Kept me informed as things were happening. Always professional and great, fast service which is what people need when their computer is down.